Session 1: Tuesday & Thursday mornings at 9:15am-10:00am, April 2, 4, 9, 11, 16, 18 - Session 1 FULL! Session 2: Tuesday & Thursday evenings at 7:15pm-8:00pm, April 2, 4, 9, 11, 16, 18 - Session 2 FULL! Session 3: Wednesday & Friday mornings at 10:45am -11:30am, Apr 3, 5, 10, 12, 17, 19 - Session 3 FULL! Session 4: Monday & Wednesday evenings at 7:00 -7:45pm, April 1, 3, 8, 10, 15, 17 - Session 4 FULL! Registration is now closed. We have filled our sessions in April. 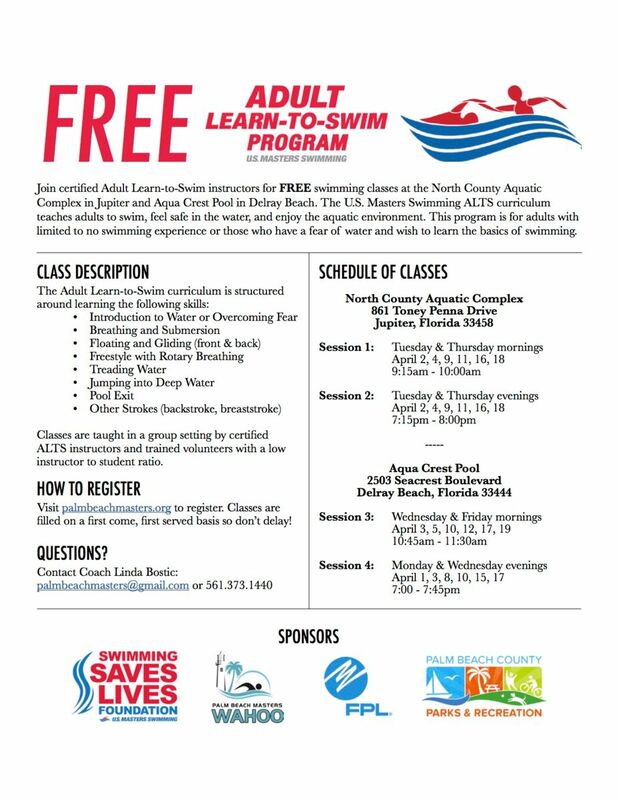 To be notified of future Adult Learn to Swim sessons, email us at: PalmBeachMasters@gmail.com !